Results vary. Scroll down for typical results. (less s&h) for details click here. Results shown represent Tummy Tuck Belt's comfortable woven compression which pulls your midsection in, giving you an instant slimming look. Results shown represent users that combined the Tummy Tuck belt with diet and exercise and other users that followed the 10 minute Tummy Tuck method twice per day that included abdominal exercise without changing other exercise and lifestyle parameters. Apply the cream to your midsection, your belly and around the sides (the love handles). Put on the Tummy Tuck Belt and do 2 minutes of standing abdominal Tummy Tightener exercises. Relax or do other activities for 8 minutes. You're done! You can now take off the belt. The Tummy Tuck Belt is not like other slimming garments. These other products simply hide the fat... that is until you take them off. But combine the unique Tummy Tuck 10 Minute Method with the Tummy Tuck diet and exercise program that ignites a fat burning chain reaction to slim away fat from your tummy. The revolutionary Tummy Tuck Belt is made with soft, flexible space age material, which provides comfortable compression which pulls your midsection inward. Wear it underneath your clothing, for an instant slenderizing look, or combine with the Tummy Tuck diet and exercise program to slim away fat from your belly. Comes in three sizes to accommodate a variety of different body shapes. You can choose to wear the Tummy Tuck Belt for an instant slimming look, and it's comfortable, so you can wear it all day long! You can keep your lifestyle as is with no added dieting or exercise. Or you can choose to combine with the Tummy Tuck diet and exercise program to slim away tummy fat. Simply follow the 10 Minute Method twice per day, and there’s no need to wear the belt during your exercise. You can do the 10 Minute Tummy Tuck Method in the morning, and then you can exercise at anytime during the day, and you’ll still slim fat around your tummy. Results shown represent use of the Tummy Tuck Belt program including the Tummy Tightener abdominal exercises. 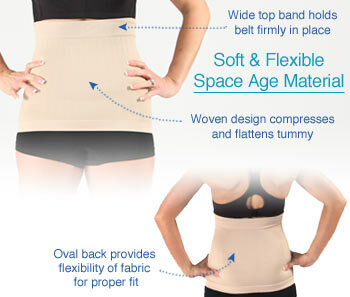 The revolutionary Tummy Tuck Belt: Gives you an instant slimming look. Simply follow the 10 minute Tummy Tuck method to slim away the appearance of belly fat. Or combine with the Tummy Tuck diet and exercise program for amazing tummy slimming results! A full 30 day supply of the Tummy Tuck cream: Simply apply this specially formulated cream to your belly at the start of each session. The Tummy Tuck instructional video: Takes you step by step through the 10 Minute Tummy Tuck Method and includes follow along 2 minute standing abdominal Tummy Tightener exercises. "You Choose How To Use It" guide: Quick start guide to help you maximize your results with the Tummy Tuck Slimming System fast! *Results vary. Consult your physician before starting this or any exercise program. Tummy Tuck Belt provides instant slimming look and fat loss begins during first week. Typical results are approx. 0.35" first week and 1" in 30 days without lifestyle change. Average results when combined with exercise are approximately 2 times more tummy fat loss vs same exercise/diet alone. Tummy Tuck System targets your belly without added exercise and diet, not other body areas or weight loss. To target other body areas and/or lose significant weight then exercise and diet is needed. Clinical scenes recreated by volunteers that were not paid for their time. Risk free money back guarantee is less s&h. Click here for details of full Money Back Guarantee and Terms and Conditions. Copyright 2010-2019 Savvier, LP. All rights reserved. Tummy Tuck® is Savvier's trademark for its exercise and size loss program, and related products.